Seen something on ebay? Post it here. Keeping all the ebay and craigslist type stuff in this one thread will help unclutter the forum and greatly improve the search function. All these links expire but the info in these threads does not, like the model #, make etc. They all produce search hits that link to threads that no longer have any pertinent info in them.........so post em here instead. sefh3, Muffler Bearing and GASoline71 like this. I found a blow up Husk 353 on CL down in Houston for $50 the other day. Emailed the guy and went ahead and got it shipped up to me here in Dallas. Guy claims he bought it for hurricane Ike cleanup and after running out of the gas the dealer sent him home with he straight gassed it. He went back and bought a new one and stripped the b&c, sparkplug, and airfilter off the old one. The ad said it would come with a "spare" muffler so I was hoping to get a non cat with it but either he or the dealer was smart enough to swap that onto the new saw so now I have a blown up $50 Husky 353 with a cat muffler installed and a "spare" cat muffler and a few missing parts. I'm still happy with the deal because I think I can get it back together and still have less than $150.00 in it. I'm giving it to my dad anyway, I'm going to stick with my old 026, unless this thing really blows me away. I don't have any local Husky dealer and I have never handled a pro type Husky. I am impressed with the quality though, it seems to be very well built and thought out. I do prefer the feel of the 026 and the clutch arrangement. jmman, ReggieT and Philbert like this. Nope, no bad scratches on the cylinder wall either. Loose that cat, muffler mod it, and open up the ports a bit before you put it together (I did one, I know the pics are on here) and you will end up giving the 026 to your dad!! I'm having a heck of a time finding a piston for this thing. Oem is sky freakin high price wise and the only aftermarket I can find is a Golf which I would prefer not to use. I guess I will if I must though. Any of you Husky guys out there know if the 45mm piston from a 51 is compatible? I'd love to but that is out of my budget! What is the diameter of the 353 piston? I thought it took the same topend as the 350, which is 44mm? I saw a mention of the Husky 51 piston working in the 353 and its 45mm. The post 2003 versions of the 350 and the 353 have a 45mm piston. The older 350 was 44mm I believe and back then I think the 353 was called the 351. The 45mm 350's have a dished piston while the 353 is flat. This is my current understanding of the way of things. There are some ads for Golf pistons on ebay that say it works with the 51 and 353 with the 45mm size bore. I was hoping someone had already tested this theory. How bad does the remainder of the piston look? 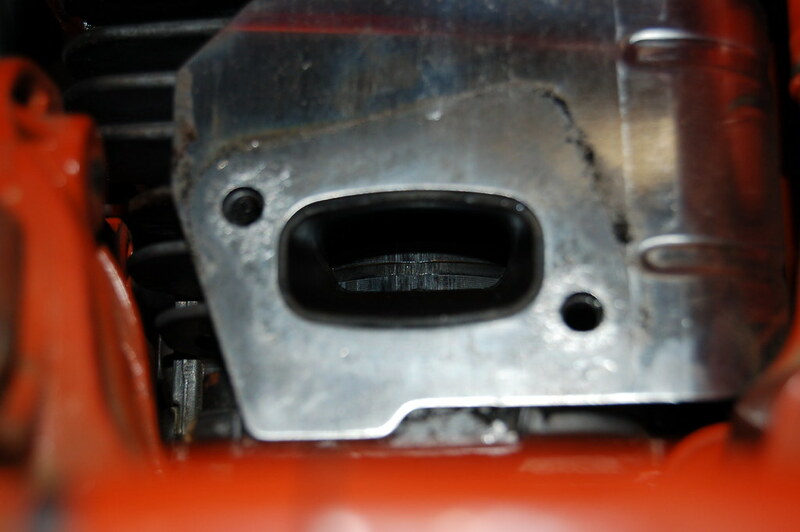 If the pictures show the worst of it, you might be able to salvage the piston and re-ring. 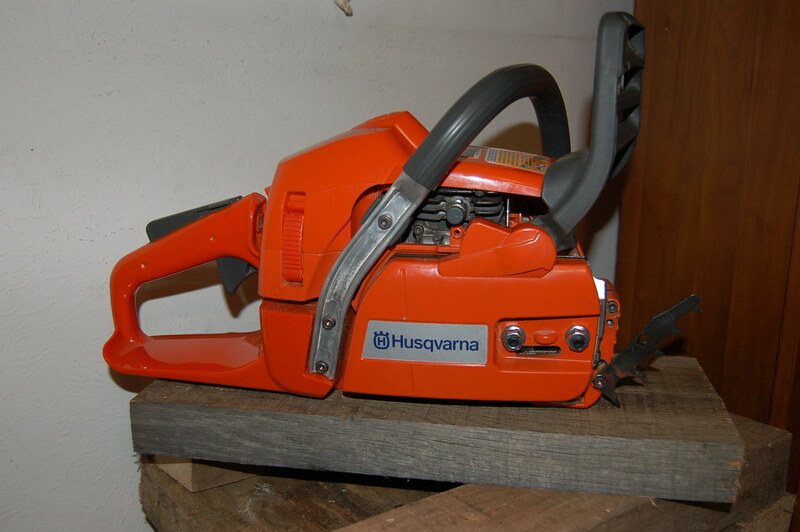 Another option would be to look for a 350 parts saw with a good top end. The 353 is the sibling to the Jred 2152, and the 350 the 2150, I think. The 350 has a dished piston to lower the compression, in my understanding. I might see if this one is salvagable, or at least good enough "for now" until I decide what to do. The possibility of a 51 piston is intriguing to me, I might post a wanted ad to see if anyone has a trashed 45mm 51 piston that they can send me for measurement and comparison purposes. Ya'll ain't going to believe this one. Yep another Ebay buy gone wrong. Notice, good description, decent pictures, good seller feedback. It was a saw that I really wanted to go with my Poulan 245A and 245SA, especially since it was a little different version by being a early saw with a point ign, and the self activating decomp that's rarely seen. Ok I bought the saw at a good price to me. My max bid was $100 so I was happy to get it at that price. I waited to pay till I could get with the seller to uprgrade the shipping to make sure it was insured and such, and the seller was very nice and accomidating and even provided a phone # incase of any problems. Well the saw arrived well packaged in just 3 days and I excitedly took it into the shop to check it out. I pulled the plug and put the spark tester on it and tried to pull it over. What happed next put me in shock, yep I almost yanked the whole saw off the bench because it was locked up! I couldn't believe it. I looked the plug and found some type of whiteish corrosion on it and found the same looking in the plug hole with a flashlight. I removed the muffler and couldnt see much as the piston was stuck, rings above the exhaust port, but the piston skirt looked ok. I went right to the phone and called the seller who couldn't believe it either, but was very nice and explained that he was at work at that moment but he would call me back on Sunday night. I then turned the saw so the cyl was upright and filled the cyl with Kroil oil and let it soak overnight. The next day with a little effort, turning the flywheel by hand it broke loose but was gritty turning over and then I noticed the scratches on the upper piston and rings. Looking the saw over closer and removing the fuel tank cover I found alot of water in it, then it hit me. The saw had probably been power washed and then set for a while before being sold on Ebay! That's why it was good when the seller checked it before listing it and was locked up when I got it. Anyway I emailed the seller and provided photos to him before he called Sunday night and he admitted that he had power washed some of the saws he listed before he decided that it might not be a good thing to do so. He offered to make it right and we discussed a couple different ways to do just that. I decided to keep the saw and take a partial refund. The saw is just to nice to let go. It's neat with the original power sharp system, original roller nosed bar and barracuda chain. I actually had the saw running later that day just by cleaning the points and putting a fuel line on it. It won't run well at all though as I can only get a max 80lbs compression out of it. Rings are just too bad and the cyl don't look good either from what I can see through the exhaust port. 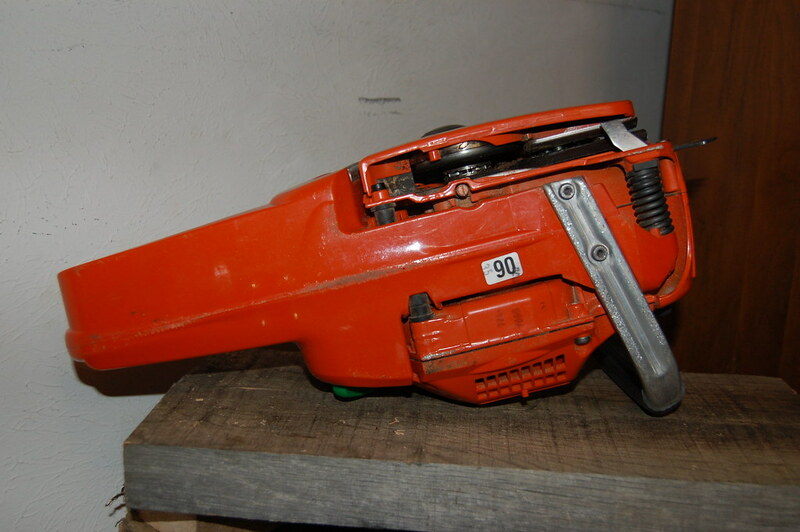 I don't have too much hope of finding a good cylinder for it, as it has a different decomp setup then I have seen and I'm thinking that it might be special to only the Dayton branded saw's even though I thought they were always exactly the same as the Poulans. 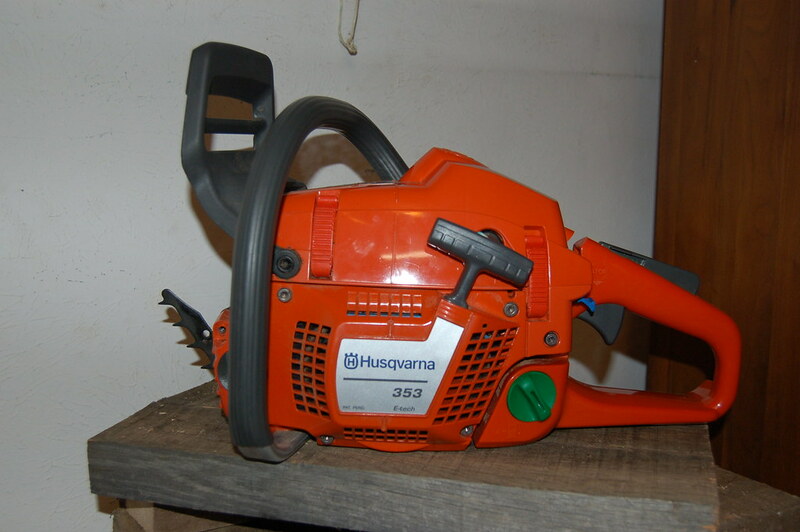 This saw is a 2Z463 and I did notice that the 2Z463B which is a later model had the same decomp and electronic ign like my later 245SA has. I am going tomorrow to pick up a NOS 245SA cylinder that uses a screw in decomp and see if I can have a threaded sleeve machined to fit the plunger type decomp valve into it. Anyone ever seen this decomp setup on a Poulan? Here's the other style on the 245SA that I have. Pro Mac 60. Was advertised as "not running", and I had no expectations of such. But the saw had several hard to find parts. Bought it reasonably. The seller had thrown the saw in a medium wieght cardboard box, PUT THE BAR DIRECTLY ON THE SAW, put the chain in a plastic bag, and threw a couple chunks of styrofoam on top. Taped her shut. The chances of this saw arriving intact were somewhere between slim and none. The rear handle was plumb broken off from the fuel tank assembly, and the bar had scored the snarf out of the air filter cover. The sheer negligence thoroughly pizzed me off. The saw was from Florida. Upon a bit closer inspection, it looks like the saw had been sitting on a dock in southern Florida for a few years. I mean, the paint on the outside looked good, but the thing was full of salt air corrosion--I swear there were those barnacle thingies growing in the fuel tank! (what do I know--I'm a Rocky Mountain boy...) There was no mention of salt corrosion in the description, and it was something that would be tough to miss. But the parts I was originally after were still good, but I was also hoping for a few more parts on the saw too--phssss, not much else was any good. But....what a shame, as I took the saw apart, it was obvious this was a low hour saw--the heat shield was hardly discolored around the exhaust, the fins were not discolored.....but the cylinder was plumb locked up--I still haven't got it unlocked. I emailed the seller, to his credit he offered to refund my money and pay for shipping back. I was not going to be anywhere near a Post Office for the next week, I didn't want the hassle, so I asked if he would be willing to give me a partial refund. He seemed to get pizzed and told me to send it back or keep it. So fine, I took my lumps and kept it. But between the "I don't give a hoot shipping", and the absence of any accurate description, I gave my first negative feedback ever on ebay (and I've bought a lot of firearm, handloading, and saw stuff on ebay). In my estimation, the seller was just seeing what he could get away with. Overall, I think ebay sellers have been great with me, maybe because I have stayed away from questionable appearing items/descriptions, but I finally got snookered. that stinks that you guys had these problems. I do a lot on ebay and have been bitten twice, once for $175 which I got $150 back and once on a DVD that was $8 that was suppose to be a double feature and wasn't and the seller asked did I really think I was going to get a double feature DVD for $8 to which I replied yes, it was listed as a double feature, I didn't get anything from that and that was my second negative for a seller. Why won't these pictures show up, been posting them just like I always did? Yeah I have had good luck on most things on Ebay, but I try to be carefull. Thing is on this one I honestly believe the seller was trying to be honest. He had like 10 saws listed at once and I think he said he started getting them ready to list back in Dec, so there was quite a bit of time for the water to damage it. I didn't even care about the money really, just was extreamly dissapointed that a nice saw was maybe ruined because he took his dumbass pill that day. I know exactly how you feel, it's like when we were kids and got a new toy and just couldn't wait to get it home and play with it only to find out that it was broken. Do you think you'll be able to get it going? Four hours of "Smurfs Gone Wild"? GrassGuerilla, x308 and ReggieT like this. I emailed the seller, to his credit he offered to refund my money and pay for shipping back. While I think it was a raw deal, if he offered full refund and payment for shipping back, I would hesitate to neg feedback someone. Yes, it would have been an inconveniece, but at least you would have been made whole.